Figure 1. Spectrogram of the Eastern Whipbird duet song. Figure 2. The maginficient Eastern Whipbird. Eastern whipbirds rank among the most fantastic singers in the world. Their songs are given as duets between members of a mated pair. The male begins the duet with a two-syllable song; his song begins with a sustained pure-tone whistle which is followed by an explosive whip-crack. The female completes the duet by singing a two-syllable response, which sometimes sounds like ‘chew-chew’. The above sound file begins with a male singing two solo songs, but he is joined by a female for his third and fourth songs. The remainder of the sound file demonstrates the variation between duets of multiple pairs. Eastern whipbirds give scolding chattery sounds when disturbed, as heard at the end of the sound file. Male whipbirds create their unique whip-crack sound by singing a very rapidly ascending or descending whistle. The male’s whistle stretches from 500 to 8000 Hz in just 0.1 seconds; very few animal vocalizations cover such a broad frequency range in such a short space of time. The actual ‘crack!’ sound may be created by the pressure of this high-amplitude sound wave echoing off the leaves in the whipbird’s rainforest habitat. Although the introductory notes tend to be 2.0 seconds long and have a frequency of 3000 to 4500 Hz, males can vary the length and pitch of their introductory syllables. Particular introductory pitches seem to be associated with particular upslurred or downslurred whip-cracks, and these associations may form the basis of song-types in eastern whipbirds. Amy Rogers of Australia National University is presently studying the song system and mating system of the southern race of eastern whipbirds for her dissertation research. Among other intriguing findings, Amy has found that female whipbirds may engage in duets with birds other than her social mate. 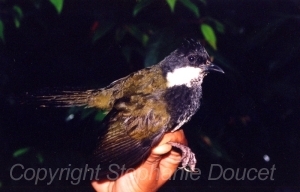 In the north, eastern whipbirds are found in dense rainforest, but further south they may also be found in more open forests and scrublands. Two races of eastern whipbird live along the east coast of Australia. The race P. o. olivaceous is restricted to a small area around the Atherton Tablelands. The race P. o. lateralis extends from central Queensland south to Melbourne. M. Watson. 1969. Significance of antiphonal song in eastern whipbirds, Psophodes olivaceus. Behaviour. 35:157-167. All information copyright Dan Mennill, 2001 (unless otherwise indicated). No recordings, photographs, or other information may be used without written permission (email me at dmennill AT uwindsor DOT ca).